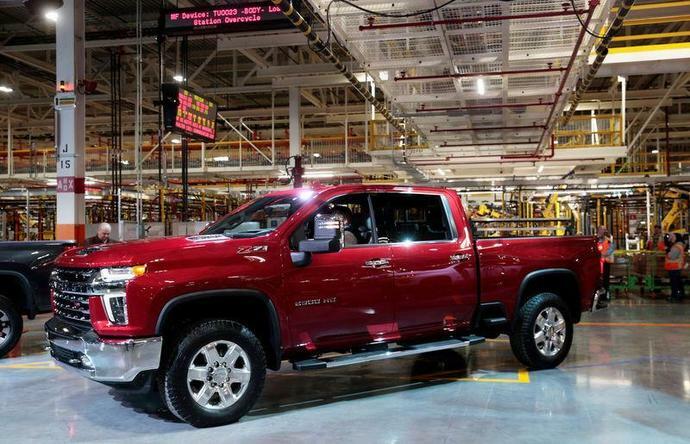 DETROIT (Reuters) - General Motors Co on Wednesday swung to a quarterly profit thanks to high-margin pickup trucks and crossovers in the U.S. market plus cost cutting and maintained its full-year 2019 earnings forecast, lifting its shares 1.7 percent. All of the No. 1 U.S. automaker's profit came from North America, where those lucrative models helped overcome an overall drop in the number of vehicles it sold. The company's operations in China and South America combined added nothing to the company's bottom line in the quarter. GM Chief Executive Mary Barra has made it clear that, despite the criticism, the cutbacks are necessary for the automaker's long-term financial stability and to pay for the development of electric and self-driving vehicles. "We can't run at a 70 percent utilization," Barra said Wednesday about the company's plant usage rate. "We had to improve that ... It's a transition we have to go through." An industry rule of thumb is that automakers' lose money when plants operate below 80 percent capacity. Barra also cited the company's efforts to shift many of the affected hourly workers to other plants, lessening the impact of the cuts among blue-collar workers. GM said on Wednesday that China's $300 million in operating earnings in the fourth quarter was offset by other international markets. It sold fewer vehicles in China, its largest market by volume, and said weak currencies in South America had also impacted results.